NuSTAR may have been built to observe black holes and other objects in deep space, but NASA's supersensitive space telescope can also do a bang-up job of imaging the sun. Just have a look at this glorious new photo released by the space agency on Dec. 22. X-rays stream off the sun in this image combining data from NASA's Nuclear Spectroscopic Telescope Array (NuSTAR) space telescope, overlaid on a photo taken by NASA's Solar Dynamics Observatory (SDO). The photo is the first taken of the sun by NuSTAR and is the "most sensitive solar portrait ever taken in high-energy X-rays," according to NASA. The green and blue portions of the image show highly energetic X-ray emissions. The red represents ultraviolet light captured by the Solar Dynamics Observatory, another NASA space telescope. In addition to looking pretty spectacular, the photo may point the way to some pretty important science. 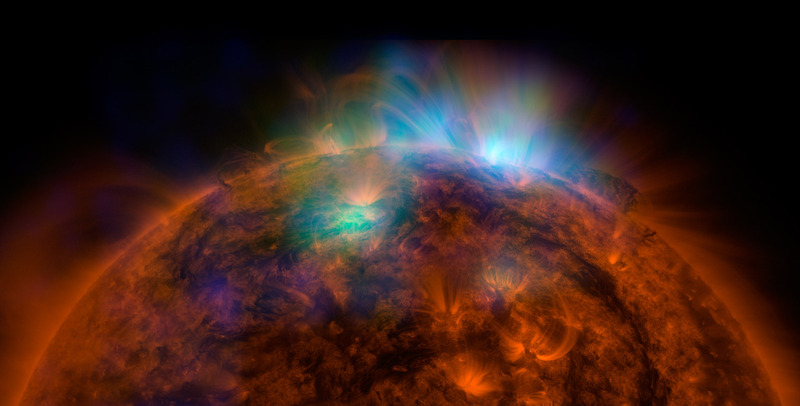 Space scientists are hopeful that by gazing at the sun, NuSTAR may be able to help explain why the sun's outer atmosphere (corona) is so blazingly hot (1 million degrees Celsius) while its surface is much cooler (6,000 degrees Celsius). The key to this decades-old puzzle may be smaller versions of the colossal solar flares familiar to solar astronomers. At this point these so-called "nanoflares" are still hypothetical, but scientists believe that they, in combination with big solar flares, may be the sources of the corona's intense heat. "NuSTAR will be exquisitely sensitive to the faintest X-ray activity happening in the solar atmosphere, and that includes possible nanoflares," Dr. David Smith, a solar physicist and member of the NuSTAR team at the University of California, Santa Cruz, said in a written statement. The idea of using NuSTAR to look at the sun surfaced about seven years ago, long after the space telescope's design and construction were under way. When she first heard of the idea, Dr. Fiona Harrison, a professor of physics and astronomy at CalTech and the mission's principal investigator, was more than a little skeptical. "At first I thought the whole idea was crazy," she said in the statement. "Why would we have the most sensitive high-energy X-ray telescope ever built, designed to peer deep into the universe, look at something in our own back yard?" Eventually, of course, Harrison came around to the idea--and the new photo proves that it was a beautiful one.